I’ve had a chance to check out all three and thought I will be happy to provide more in-depth reviews, I can share my initial thoughts. 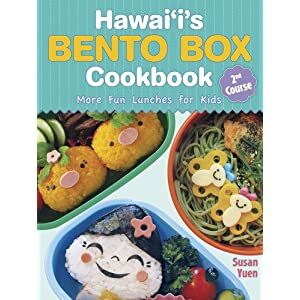 The first book I really looked through was Hawai’i’s Bento Box Cookbook by Susan Yuen. The bentos are ADORABLE. They are perfect for small children who would certainly delight in opening their lunchboxes to find whimsical scenes. I love that it’s in a spiral-bound book, which makes it VERY easy to lay flat and go through the steps without having to struggle to keep the book open. The book is broken into two main sections: the artistic bento hints and the recipes. The artistic bento IS indeed artistic, and for the most part extremely easy to do provided you have the right tools. The AMOUNT of tools you need in order to do them, however, can be a overwhelming. Nori punches or scrapbooking punches, cookie cutters (butterfly, cat, bear, bunny, pig, chick, fish, flowers, leaves, not to mention the plain circles, ovals, hearts, stars, etc), straws, sausage cutters, musubi (rice) molds, and a WHOLE lot I didn’t even mention. I would estimate that if I wanted to create the bentos in the book, I would need about $150-200 worth of tools in order to do them. On the other hand, I certainly appreciated the recipe section, which offers a variety of dishes that can be used in bento boxes, most of which need only a few “fresh” ingredients and then usually spices you would normally have around the house. I found several recipes that I would LOVE to try and do not seem intimidating to someone without a great deal of culinary finesse. Overall, the book is great to offer some fun ideas for your young child, just be aware you’ll need to designate a special drawer in the kitchen for all the accoutrements. The second book I was reading was Yum-Yum Bento Box by Crystal Watanabe (aibento.net) and Maki Ogawa (cuteobento.com). This book is a bit more in depth than the Susan Yuen book, includes a bit of history behind bento, and a more comprehensive list of items one might use to create bento. Again, make sure you have a drawer designated for your bentomaking tools, but I got less of an overwhelming feeling from this book than the previous book, and I think it is due to how it is presented. There’s five full pages dedicated just to the tools used, and short explanations of what they are, how to use them best and where you might even find them, but I didn’t feel particularly pressured to acquire EVERYTHING. They even include two pages of different ways to create aspects of characters… for instance ears can be represented with deli meat cut outs, cheese cut outs, meatballs sliced in half or even two fried noodles. Once they move into highlighting their bento creations, the recipes are right there, along with estimated time it takes to make them, and tips for alternatives if you do not have all the ingredients or tools. Lastly, they offer a great deal of reference – a lot of websites to learn more about bento as well as places to purchase items you might not find locally, etc. As with the Susan Yuen book, the recipes look fairly easy to follow and create myself. 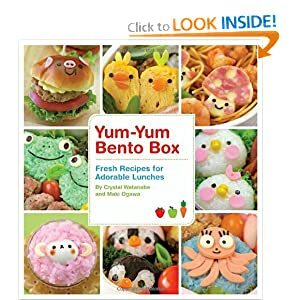 Overall, I think the bento from this book would definitely appeal to not only my 11 year old daughter, but many dishes would definitely appeal to my husband (minus some of the cute faces). 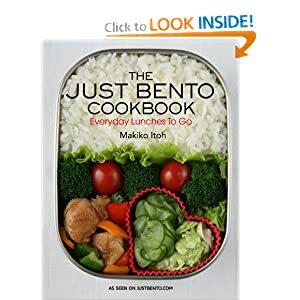 The last book I picked up was The Just Bento Cookbook, Everyday Lunches To Go by Makiko Itoh, who also runs the website JustBento.com. This book is much different from the first two, in that there are no cute faces or characters – this book is dedicated to creating meals that are healthy portions, include healthy ingredients, are tasty, and are aesthetically pleasing. The recipes are almost stupid-easy, and Itoh is kind enough to mention how long something will keep in the fridge or freezer (this point is a real bonus for me!). The recipes are not just traditional Japanese foods, either. One group of recipes focuses on lamb or beef koftas, baba ghanoush and hummus, all of which look and sound incredibly tasty. There is also a section of bento staples to keep in your pantry and fridge, as well as a detailed description of many typical Japanese ingredients and where you can find them. Overall, aside from not being spiral bound, this book is just about perfection! All three books offer something to me – I did not feel I wasted my money on any of them. I am eager to try recipes and ideas, and see how they go over with my family. As time permits to put each of these books through their paces, I’ll be doing a more detailed individual review. Enjoy! Posted on March 4, 2012, in Bento, Food, Random, Recipes, Reviews and tagged bento, bento lunch box, food. Bookmark the permalink. Leave a comment.